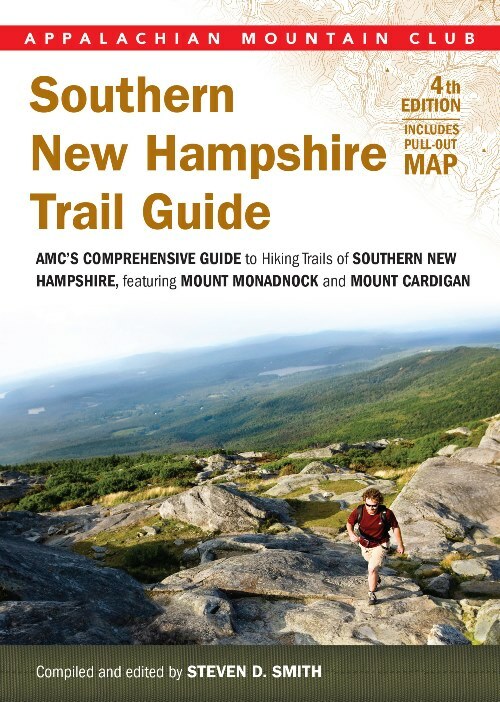 AMC Southern New Hampshire Trail Guide, by Steven D. Smith, 4th Edition, 2015. New expanded edition of guide to New Hampshire trails from the Lakes Region south. Covers Lakes Region (including Ossipee and Belknap Ranges), Monadnock, Wapack Trail, Sunapee/Pillsbury, Cardigan, Kearsarge, Merrimack Valley, Seacoast, major state parks (Pisgah, Bear Brook, Pawtuckaway) and outlying hills. This new edition includes a number of new trails and 16 new in-text maps. The guide comes with a large scale color folded trail map (100-foot contours) for Monadnock, Cardigan and Pillsbury-Sunapee plus a new Belknap Range map, showing mileages between points. 320 pp, 5" x 7".